No matter how beautiful or functional your website is, it will eventually need updating to keep it fresh and make use of new SEO and design techniques. The biggest concern in this situation is almost always a question of if your company will lose traffic and how much. And it’s a legitimate concern: up to 70% of marketers who release a new design will see a decrease in their traffic or sales. Because of this high percentage, many companies are afraid to update, but it doesn’t have to be that way. In this case, preparation was key. 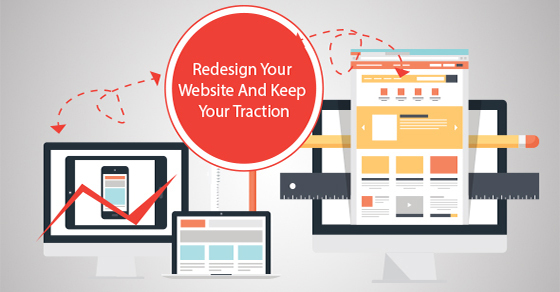 Redesigning your website provides you with some great opportunities to update the CRM, re-strategize, target new keywords, and update the URL structure of your website. Optimization for each page should be carefully mapped out to include changes to titles and meta descriptions (which are now 155 words and not the usual 160! ), as well as any updates to your targeted keywords. By using tracking codes and removing indexing restrictions, it’s possible to restructure internal links and prioritize effectively. Google’s Matt Cutts has previously stated that about 10-15% of pagerank loss occurs due to 301 redirects, but this loss can be mitigated by increasing engagement! Updating sitemaps plays a key role in improving engagement and traffic to your website following a redesign. By resubmitting these new sitemaps to Google through Google Webmaster Tools, you can ensure that the search engine is aware of your changes and equipped to send users to the right part of your website. When implementing this, Razoo experienced an impressive increase in the number of pages sending traffic to their website: the number jumped from under 500 to more than double at 1248. They also saw a drastic increase in the number of keywords which sent organic traffic to their website with that number climbing from 548 to 1347. Seeking to demonstrate the importance of planning ahead, Steven Macdonald from eMarketers ran a test comparing two websites that had been restructured.